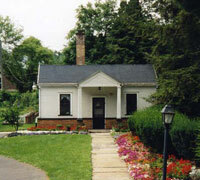 Do you love the history of Niles, Ohio and want to preserve that history and memories of events for future generations? As a 501(c)3 non-profit organization, your donation is tax deductible. When you click on the Donate Button, you will be taken to a secure Website where your donation will entered and a receipt generated. Built in 1862, the Ward Thomas House was the home of two prominent Niles industrial families. James Ward, who built the house, was a pioneer in the iron industry in the Mahoning Valley. He built puddling plants, Falcon Nail and Iron Company and the Russia mill for manufacturing steel. The second owners were John and Margaret Thomas who came to this country from Wales. The Thomas family founded the Niles Firebrick Company and later, Mahoning Valley Steel. The Thomas family occupied the house until 1969 when the property was deeded to the City of Niles. 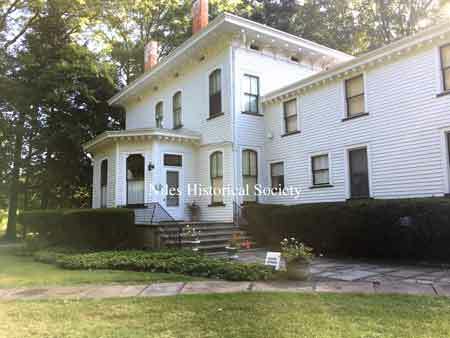 Through the efforts of Clare Westenfield, a local attorney, the house became the home of the Niles Historical Society. The house is now a museum consisting of fourteen rooms, many furnished in the style of the period, some with furniture owned by the Thomas family and donated to the museum. The museum collection has more than 5000 items, including many from the two families. 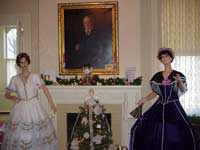 Throughout the museum, mannequins wear life size replicas of the White House ladies’ gowns displayed at the Smithsonian Institution in Washington, D.C..
Also on the five acre property are a recently restored barn and a 1925 green house as well a various gardens and 56 varieties of trees in the arboretum. Care of the house and gardens is done by volunteers and the house is decorated appropriately for each season. Proceeding from the back porch of the Ward-Thomas house, a walk-way leads to a secondary building. 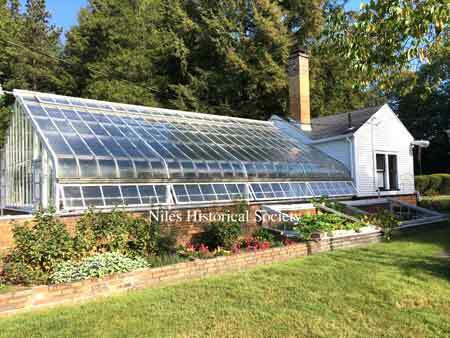 This building is used as a workspace for the greenhouse. 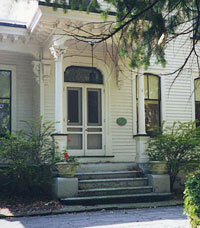 The first Sunday of each month the Thomas House is open to the public from 2 - 5 pm. The last tour begins at 4:00 pm and ends at 5:00 pm. The Niles Historical Society will hold its annual Spring Banquet and Fundraiser on Thursday April 25, 2019 at 6:00 at Ciminero's Banquet Centre 123 N Main St., Niles. Tickets are $30.00 and may be obtained by calling 330-652-8329.The speaker will be Sean Posey, historian and author of the books Lost Youngstown and Historic Theaters of Youngstown and the Mahoning Valley. The monthly open house of the Ward-Thomas House at 503 Brown Street will be Sun. April 7 from 2:00-5:00 with the last tour beginning at 4:00. The membership meeting will be Saturday April 6 at 10:00 in the Westenfield Room. Society representatives recently participated in Historical Society Day at Park Vista in Youngstown where they presented items featuring Niles history. Plans are being made for the Niles third graders to visit the Ward-Thomas Museum in May to learn about local history. Society memberships may be obtained for $20.00 an individual and $30.00 for a family. All are welcome to join. Looking for a unique gift for that person who has everything? Try one of the Niles historical books.